WHEN the open top bus parade is over and the newly inked ‘Aitor’s Army’ tattoos telling of title glory are paraded proudly around the hotel pool we will look back over the magic moments of the season and beam about cup wins at Man City and Arsenal and days at Derby and Bournemouth that swung it decisively our way and gush about the soon to be fabled fixture at Fulham that sealed it. Should those celebrations come to pass no one will remember the win-ugly bread-and-butter battle to a 1-0 win at Brentford. To be fair I’m already actively trying to forget it. It was scrappy, tense and low quality fare played in atrocious conditions. It was all long balls, stray passes, niggly fouls, squandered chances, misfiring moves and mistakes. And it was freezing. It was light years away from the Etihad. It fell well short of the demolition of Derby or the clinical defeats of the Bees and Norwich at home. And it was won with a penalty against the run of play. No one will be celebrating it as a true reflection of the team’s philosophy. Honest Aitor admitted that his side were “lucky”. And yet, these are exactly the building block battles that get teams promoted. A MULTI-ZILLION-PETRODOLLAR-JUGGERNAUT deservedly beaten. The champions. On their own patch. What a day. It was a famous FA Cup coupon-buster as brilliant Boro battled and showed silk and steel to see off City. Boro acquitted themselves well at Anfield in a pulsating and proud performance but that side was disjointed and demoralised and had a few ring rusty players and has gone on to be distinctly average this term. But the win at City was several gears up. They are a far better team. And a far richer team. The home side started with £170m worth of players on the pitch and had another £70m on the bench. They are the reigning Premier League champions, are second this time round and are in the Champions League. They included Galaticos like Navas, Zabaletta, Aguerro and Silva. And Boro beat them. And it wasn’t a fluke. It wasn’t a spawny win. Boro deserved it. They earned it. They worked for it. They matched City tactically and bettered them when it came to energy, passion and motivation. They were organised, disciplined and focused and they carried out out Aitor Karanka’s meticulously prepared game plan to the letter. MATHS of the Day: Two games, four goals, six points. Second place. One point off the top. Two ‘doubles’ in four days. Unbeaten in six. Undefeated at home in 11. Four successive home wins with nine goals scored. Six clean sheets in eight games. Only 18 goals leaked in 27. One goal conceded in 581 minutes. Stats pretty good no matter how you look at it. Boro may have ‘leeked’ late on but they did a professional job against hard-working Cardiff to clock up what felt like a second successive significant important result at a pivotal point of the season – and on a night when leaders Bournemouth slipped up at Leeds, a results that prompted a very Riverside rare cheer for our Southern cousins. Boro are now just one point off the top. Is it only a week since it felt like we’d lost ground? That game was a bit of grind at times and there was a frantic finale but Boro showed spirit before winning. It was the day when Clayton showed why he was a better bet than Butterfield, Dimi showed he was a safer pair of hands than Meijas, and Grant Leadbelter announced his howitzer intent for the season with an outrageous molecule melting 35 yard “thunderbastard.” There was a loud and proud sell-out 4,000 travelling army there as well. That game was a sign of things to come: that match was the start of a now well balanced Boro’s long climb towards the promotion pack. Fast forward five months and Boro ground out another win against Huddersfield that could prove just as crucial and just as timely a boost as that first clash. And which was just as tense right to the final whistle. A GOOD point gained at Reading? Or two poor ones squandered? Or both. We know from pop-star-turned Professor Brian Cox and his trendy TV brain-busting science shows that in quantum physics matter can exist in two distinct opposite forms – wave and particle – simultaneously. Maybe in football, when placed under the extremes of pressure and heat at either end of the periodic league table, there is a similar phenomena with points from draws taking on a contradictory dual existence. SO. MANCHESTER City. The petrodollar juggernaut. The arriviste Arab sheiks’ plaything come global branding tool. Oh well. It isn’t the tie anyone would have made their first choice. Even if you fancied a glamour tie on the road, if you rattled off the “big teams” you fancied in order of preference you would still add them as an after-thought. Even if they are reigning champions. They are a few years away from established elite status yet. But if you are going to go away in the cup you may as well make a day of it: its a great new stadium, well appointed with good sight-lines, it will probably be fairly priced, Boro will take another massive Parmo Army and it is a relative short haul. Let’s do it. 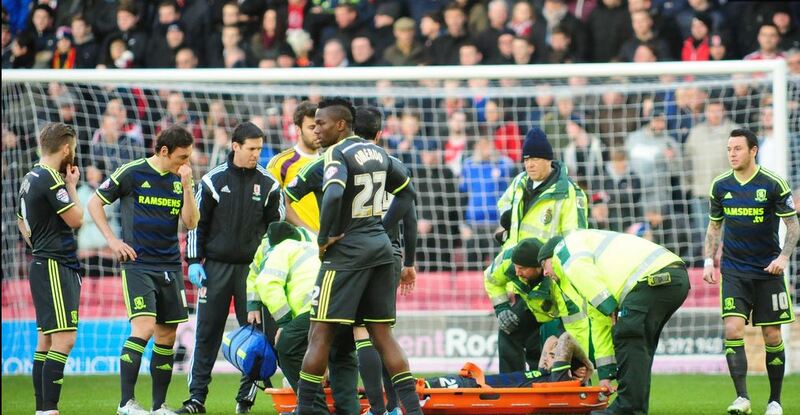 BORO beat Barnsley comfortably but the day was blighted by yet another cruel blow for injury jinxed Rhys Williams. There was barely a minute on the clock when he down, thumping the turf as much in anger and frustration as the agony. Play had moved up-field when I noticed him down. I didn’t see a challenge. There wasn’t one in the draw with Wigan last January when he went down with the original injury. But it was clear he was in considerable pain and after a few minutes brief treatment he looked to be in tears as he was stretchered off to ominous respectful applause. There was more applause as he appeared later on crutches to watch the rest of the game from the bench and he acknowledged the fans bravely but you could sense that both feared the worst.